Yet another great opportunity this weekend to get out in the sunshine and get some shopping underway before the kick-off to shopping season post-Thanksgiving. Forget Black Friday deals, here is a chance to support local and developing artists within the greater community while taking home one of kind crafts for friends and family. Don’t miss out! This Saturday only!!!!! 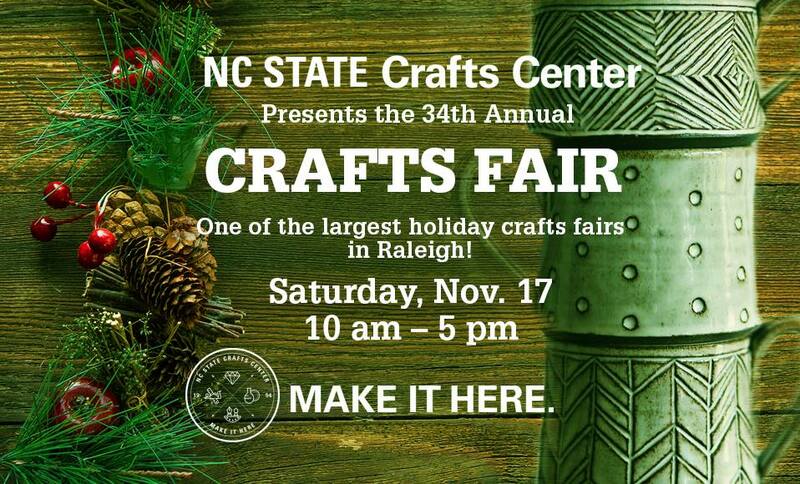 Head to Raleigh for one of the biggest craft fairs of the holiday season. Over 60 local artists – handcrafted pottery, woodwork, jewelry, mixed media and more! FREE parking. ONLY $3 admission and children under 10 and NC students: FREE. There will also be food trucks onsite and general and holiday cheer abounds. Did you know, that NC State Arts Department maintains the Crafts Center as one of their programs targeting NC students as well as the general community. You can use their crafting studio as a non-student as well as enroll in non-credit classes to benefit from mentorship and technical assistance with any craft venture. The crafts specialized in are woodworking, pottery, photography, fiber arts, lapidary, glass, jewelry, metals & more.